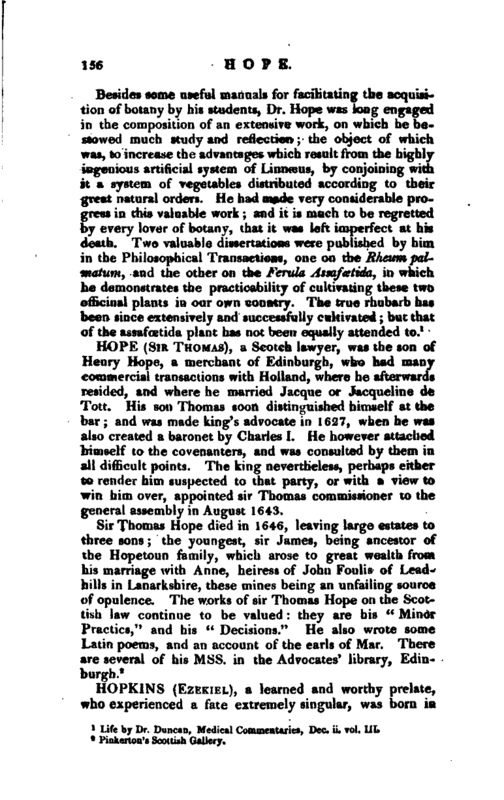 , a Scotch lawyer, was the son of Henry Hope, a merchant of Edinburgh, who had many commercial transactions with Holland, where he afterwards resided, and where he married Jacque or Jacqueline de Tott. His son Thomas soon distinguished himself at the bar; and was made king’s advocate in 1627, when he was also created a baronet by Charles I. He however attached himself to the covenanters, and was consulted by them in all difficult points. The king nevertheless, perhaps either to render him suspected to that party, or with a view to win him over, appointed sir Thomas commissioner to the general assembly in August 1643.